One of my favorite color combinations is Blue and White. I wear it constantly and collect pottery, ceramics and dishware in this colorway. 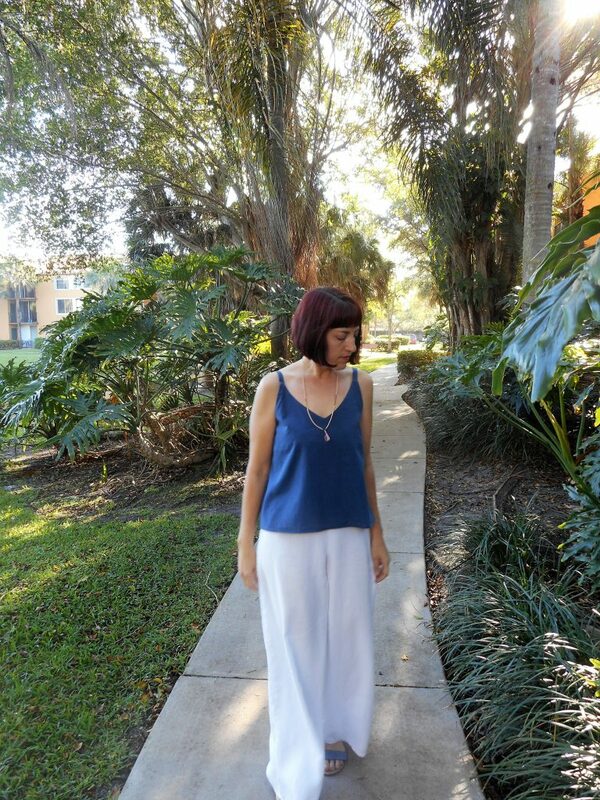 This simple cami works seamlessly into my wardrobe. 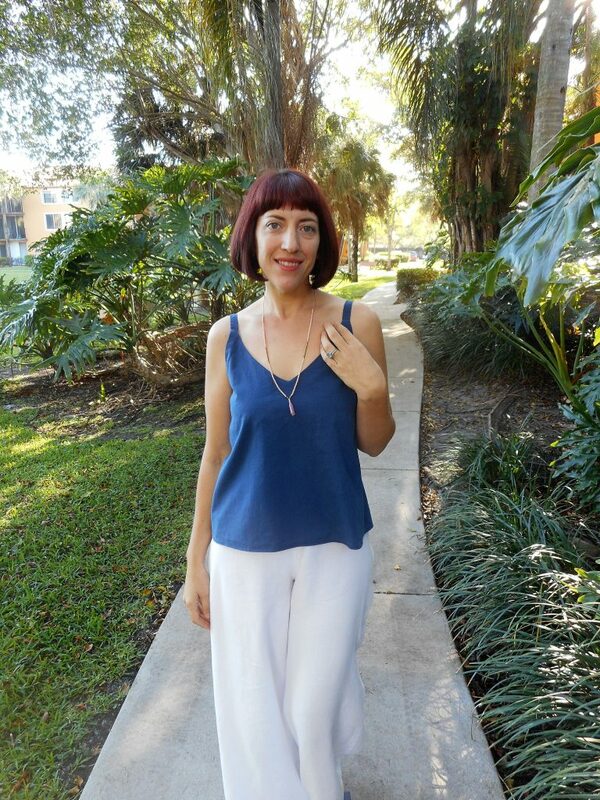 The combo of my white Holly Pants with this new navy Odgen Cami is crisp and chic while still being comfortable and airy. This first version is my very wearable muslin to tweak the fit. It’s a Cloud 9 Organics Cirrus Solid quilting weight cotton in Ocean that I purchased from Hawthorne Threads. It’s lightweight, irons beautifully and is perfectly opaque. This tank does double duty as I’ll wear it with yellow shorts (just finished!) and a red headband/bow for my Disneybound Snow White look. Just one month left until our big multi family trip! It’s also another of my Make 9 looks. It’s 3 months in and I have 4 pieces already made! Plus I just ordered fabrics to make another 2 new patterns as well as a second Odgen Cami in an ivory embroidered silk with a batiste underlay. 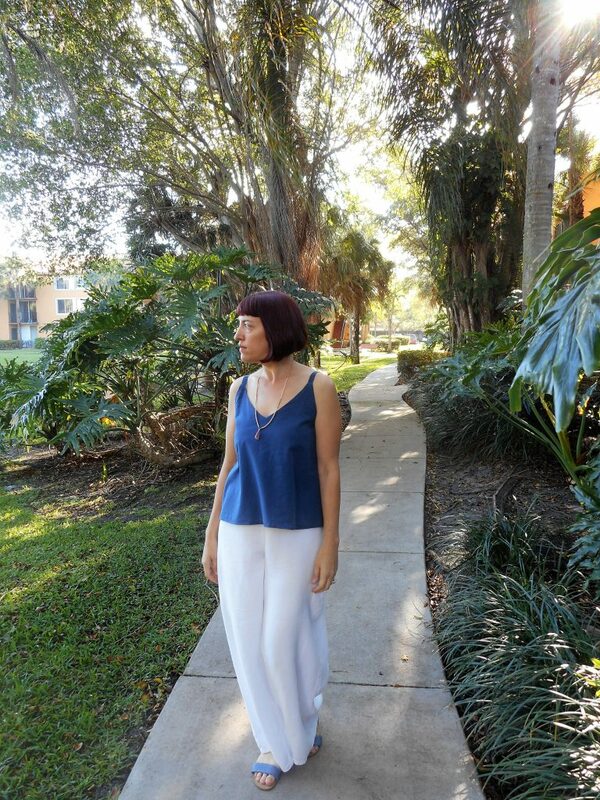 This tank was a very simple sew. I made this in a size 8 but may need to alter my next make. The pattern is drafted for a C cup (I’m a B) so I need to try a SBA or take in the side seams slightly. The fit is quite good as is but a few more tweeks will make it perfect! I really like the built in facing since it gives a clean finish and uses less than a yard but I’ll probably fully line my next version. 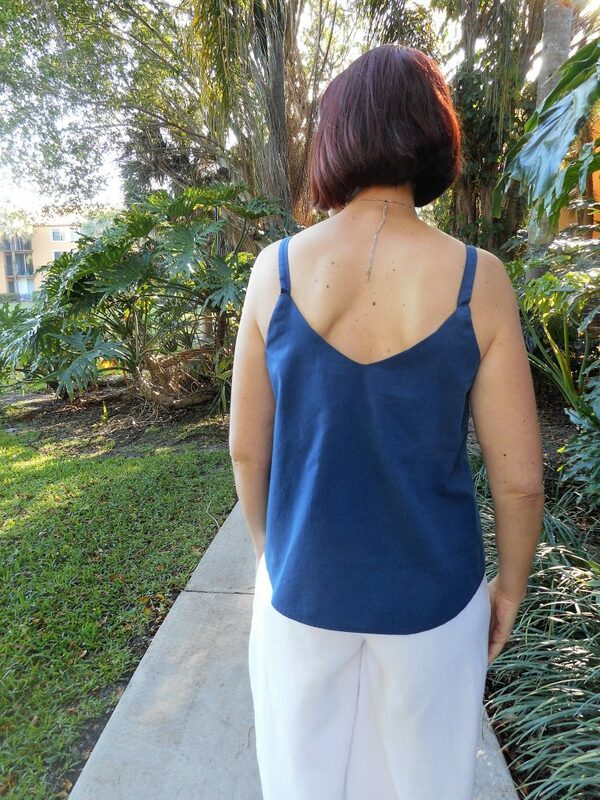 I love the shape of the back with the lowered V and that higher front V. I find it so flattering and the flare of the tank is lovely. The last few weeks have been so busy. I’ve hardly had any time to sew other than mending and none at all to blog. I was working extra hours leading up to inventory where I work. Plus we’ve just started house hunting! We qualified for a VA loan so we’re hoping to find a single family home here in town or a condo in the city. It’s actually our first time purchasing a home together since my husband bought our last condo before we met. I’m not counting this apartment since we were in such a time crunch to rent the place we’re in currently. Fingers crossed! We’ve had some really fun family weekends this last month. We went to the Florida Renaissance Festival this past weekend (It was awesome! I’m already planning out costumes for next year! ), my son had his Pinewood Derby for Boy Scouts (Nigel got 2nd Place and Ami got 3rd in the Sibling race!!!) and the week before we had a visit from my brother and spent a weekend with the whole fam. The ogden cami looks like a staple. love the outfit! Thanks Sasha! It really is a great basic. I’ll be making up a few for spring/summer.